SUMMARY: Now pregnant with her Amish boyfriend's baby, 17-year old Rose faces some serious decisions. Should she try to return to the Amish lifestyle, or should she try to convince Noah to leave his Amish family? How can she and Noah be together when they come from opposite worlds? WHAT I LIKED: I've said before that this series is not for everyone. The romance is riddled with plenty of drama and adolescent relationship games, and some readers will tire of that quickly. But I absolutely adored Temptation and Belonging, and Forever is a must-read for fans of previous books. 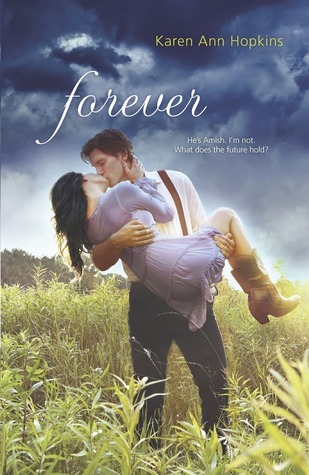 Overall, Forever is pretty good, but it isn't quite as strong as the first two. Once again, I love Hopkins' sensitivity to the Amish culture and her handling of the difficulties Noah and Rose face. I love how Hopkins does not prefer English over Amish or vice versa. Neither culture is perfect; both cultures limit freedom in different ways and have mean--even dangerous--people living among them. But regardless of which lifestyle they call home, Rose and Noah both have friends who love them and people to help them on the other side. I also like how Forever adds more voices into the story. We again hear from Rose's brother Sam, but we also get Noah's sister Sarah's point of view this time. WHAT I DIDN'T LIKE: This story just seemed so somber. Rose is depressed and hormonal through much of her pregnancy, and there are so many forces working against Rose and Noah, it's a wonder they don't just run off and live in another country to avoid it all. The romance kind of died here. Where was the sizzle we saw in the first two? I didn't feel anywhere near as connected to the characters, nor did I feel much connection between Rose and Noah. I missed that from the first two books. STATUS IN MY LIBRARY: We have Temptation on our "high school" shelf, but I did not buy Belonging due to mature sexual content. I don't have a problem getting Forever or Belonging, but the subject matter is a little mature for middle school. If someone requests the sequels, I'll get them.